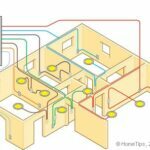 Electricity has become an essential part of contemporary life, energizing lights, appliances, heat, air conditioning, televisions, telephones, computers, and many other modern conveniences. Electricity arrives at your house from your local utility company by a power line or underground though a conduit. Most homes have three-wire service—two hot wires and one neutral. 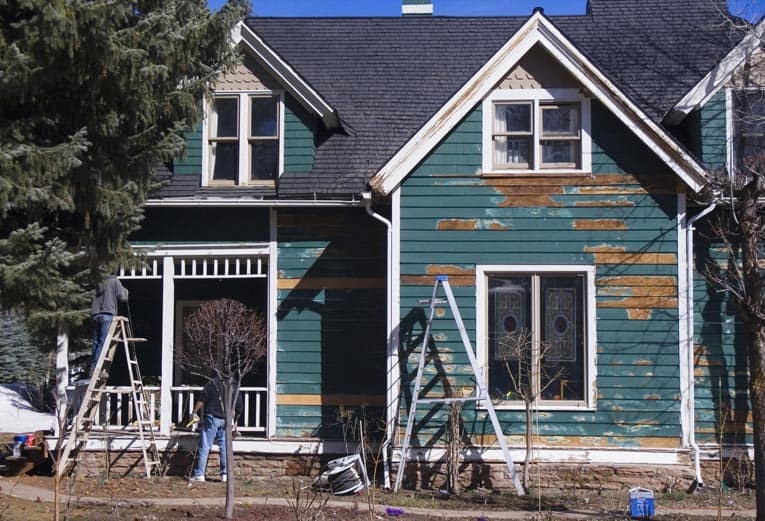 Throughout the house, one hot wire and one neutral wire power conventional 120-volt lights and appliances; both hot wires and the neutral wire make a 240-volt circuit for large appliances such as air conditioners and electric furnaces. 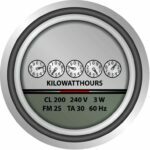 An electric meter, monitored by your electric utility company, is mounted where the electricity enters your house. The main panel is usually right next to or under the meter. This is the central distribution point for the electrical circuits that run to lights, receptacles, and appliances throughout the house. A circuit, by definition, is a circular journey that begins and ends at the same place, and this is essentially how electricity works. Current begins at a power source, powers the appliance or device along the circuit, and then returns to the power source. Any interruption in this path will render the circuit dead. 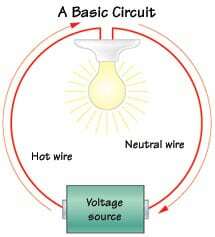 A circuit consists of a hot (usually black) wire that goes from the main panel to a series of lights, receptacles, or appliances, and a neutral (usually white) wire that returns to the main panel. 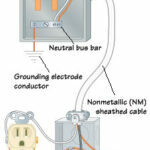 In addition to the neutral wire, a grounding wire also returns to the main panel and, from there, to the earth. The purpose of the ground is to divert electricity from any short-circuiting hot wires into the earth, preventing electric shock. Subpanels in other locations of the house, connected to the main panel, provide power to areas that have a number of different circuits or large appliances, such as the kitchen and laundry room. They also are equipped with a secondary set of circuit breakers. Low-voltage electrical systems are also common in houses for powering doorbells, intercoms, sprinkler timers, outdoor lighting, and some types of low-voltage indoor lighting. Relative to conventional voltage wiring, these systems are much safer for homeowners to work on.